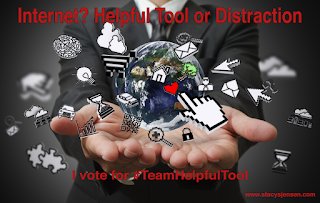 Since I'm trying to stay focused this month, I'm going to be on #TeamHelpfulTool. Full disclosure: I could be the poster child for a distracted Internet user. I fall down my fair share of rabbit holes. But, overall, I am more productive as a writer, because I have access to the Internet. Track down specialized books on my subject. Thank you Worldcat.org. Search large and specialty online bookstores for title availability. Purchase title from an historical society. They had a small online. Instead of calling them or having to put a check in the mail for the book, I was able to find the title and order it in a few moments and outside of their business hours, but during mine. Conduct several Internet searches for my research subject. Collect digital copies of files. I'm sort of old school creating PDFs and saving links via email. If I were really tech savvy, I might use Evernote or my Trello boards to collect this data. Babysteps. I am working towards this. Use EasyBib to create a bibliography to track my sources. Of course, after all my online tasks, I went offline to read books and take notes. Soon, I'll make an in-person trip to my subject's last home. While some of this could be accomplished via online research, I'm grateful for the opportunity to visit in person. Plus, I will see how a writer many decades ago lived and worked before the Internet and running water. I try to use the Internet for good whether it's asking for the perfect owl name for a fiction story or speaking with writers on a daily basis about their stories and the process. The Internet is a good thing for me. How do you use the Internet to write? What's your most helpful tool? Stacy, thank you for an introduction to some of your research sites. I'm starting to use One Note more but I'm intrigued by Easy Bib. I can't tell you how many times I think I save something to my favorites and then have to start all over. Of course the Internet has been a godsend for writers -- just look how many more authors there are since the Internet's inception. Now we just need a way to focus and alleviate attention deficit disorder, my all time weakness. I'll be working away and then...squirrel!! !